Buying a portable fire extinguisher for your building in the Mid-South is an important step toward protecting yourself, your employees, and your coworkers from fire. At State Systems, Inc., we want to provide you with the most effective fire extinguishers available. 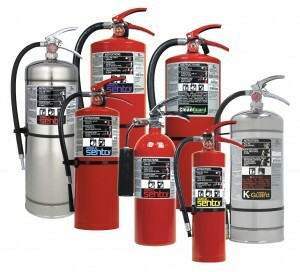 What Type of Fire Extinguisher Does Your Mid-South Building Need? Before you buy a fire extinguisher, it is important you do your research so you can be sure you’re equipping your facilities with the most effective type of fire extinguisher for your unique situation. While fire extinguishers may seem like a small component of a comprehensive fire protection system in place, selecting the right type of fire extinguisher can mean the difference between a quickly controlled fire and devastating damage to your building. Not sure what is best for you? We are here to help! At State Systems, Inc., our certified technicians have been designing, installing, and maintaining Mid-South businesses with the most effective fire protection measures for more than three decades. Those big letters you see on the sides of your fire extinguisher indicate the class of fire it’s designed for. It is imperative that you choose the right type of extinguisher. For example, you would never want to use a Class A water-based fire extinguisher on a Class K kitchen fire—not only would the canister be ineffective at putting out the fire, it could cause even more extensive injury or damage! In general, most business owners in the Mid-South choose to install ABC fire extinguishers, which are suitable for putting out most fires that may occur in a normal office building. ABC Fire Extinguishers – ABC dry chemical fire extinguishers are multi-purpose fire extinguishers and use a specially fluidized dry chemical. Commonly purchased for use in standard office buildings, they are appropriate for most normal types of fire, including wood, paper, and plastic fires, electrical fires, and fires caused by flammable liquids like oil and gas. ABC fire extinguishers work by melting on and smothering Class A fires or by absorbing heat and breaking the chain reaction of Class B and Class C fires. Purple K Fire Extinguishers – Often purchased for use by oil, gas, chemical, and utility companies, Purple K dry chemical fire extinguishers use a purple-colored dry chemical that does not conduct electricity and is extremely effective against Class B and Class C electrical fires. CO2 Fire Extinguishers – Using a cloud of white carbon dioxide “snow,” CO2 fire extinguishers remove heat and quickly smother Class B and C fires without any messy residue. CO2 fire extinguishers quickly cool fires and are useful for knocking out even hidden flames. CO2 fire extinguishers can be used on all electrical and electronic equipment with no risk of electric shock to the extinguisher operator or damage to devices; however, they may “cold shock” these devices which can potentially cause damage. CO2 fire extinguishers are not recommended for use against Class A fires, as the speed of the discharge is likely to cause flaming materials to blow away, potentially spreading the flames. Class K Fire Extinguishers – Designed to supplement a kitchen fire suppression system, kitchen-class fire extinguishers are designed to knock down flames, cool down grease and form a vapor-securing blanket to prevent further fire outbreaks. Kitchen-class fire extinguishers are usually purchased for food-service establishments such as restaurants, convenience stores, food courts, and cafeterias. If you want to buy a new fire extinguisher for your Mid-South business, call State Systems, Inc. today. We can help you choose the fire extinguisher that’s right for you so you can make sure your building and equipment are fully protected. Click here to request a quote or call us today at 866-308-5701!